Author Barbara Stensland is a recent MS acquaintance for whom I am grateful. 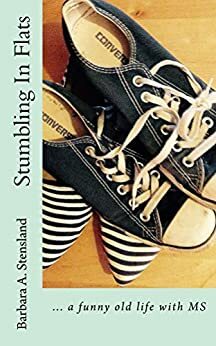 Her blog and her book Stumbling in Flats...a funny old life with MS is highly entertaining. MS Warriors around the world can and will relate to and appreciate Barbara's upbeat attitude toward an otherwise depressing disease. Thank you, Barbara, for sharing with us during MS Awareness Month. *MS Awareness Month is this month in the United States. Forgive my ignorance, but...Is this also MS Awareness Month in Wales? I’ve just checked, and we don’t have a month here in the UK, we have an MS Awareness Week, which runs this year from 22 – 28 April. There will be lots of exciting campaigns and fundraising and it will hopefully increase awareness around the UK of this life-changing illness and the effect it can have on people with MS and their families. *What is your most annoying MS symptom? How do you deal with it? I would definitely say that fatigue is by far my most annoying symptom. So hard to describe to anyone without MS, it’s a constant presence in my life. It’s the suddenness of it, the hard to predict timing of it. Every hour, every day, it could pop up and send me to bed. This makes planning really difficult; over the years I’ve worked out that I shouldn’t book two appointments in one day, no early morning meetings or late evenings. I do a lot of my socializing at home now too, so at least I can stay in touch with my friends, who are so important to me. I also have a study space at Uni but also one at home, so if I’m too tired to travel, I can study from home. The best thing though is that my boss is so understanding and recognizes when I become tired. He sends me to a quiet corner (I work on a building site) or the van and I can sleep. He’s a sweetheart and I’m really lucky. Especially when you consider my last boss fired me when I was diagnosed with MS! *What advice can you share with newly diagnosed Warriors? Allow yourself to grieve, it’s a big thing to take on board and MS can affect so many areas of your life. Give yourself time to get your head together. Surround yourself with supportive family and friends and let them look after you. Investigate all treatment options, with the help of your neurologist or MS nurse. Only read trusted medical websites. If you’re working, read up about your rights. Find good online support networks and chat with people who have been through the same thing. *How do you respond/react to negative attitudes towards MS? By proving them wrong and challenging their attitudes! I’m not afraid to speak up for myself and others with MS. Education is the key – especially making the public aware that not all MS symptoms are visible. The more we spread awareness, the more people will understand. *Discuss your thoughts on alternative/natural/holistic (essential oils, exercise, diet, supplementary vitamins) MS treatments. What has and had not worked for you? One thing you discover after you’re diagnosed with MS is that a lot of people will tell you how to cure it. The best thing to do is to ignore it; there is no cure. But there are ways to make life easier. However, one size doesn’t fit all! You need to find out what works for you. Over the years, I’ve dabbled in a few things. I’ve got a high-strength Vitamin D prescription that I take once a month. I also make sure I’m as mobile as possible, when it’s possible. I’ve also found that too many carbs slow me down, so I try to eat as many fresh vegetables as possible. It’s hard to say what didn’t work, as I didn’t really implement any huge lifestyle changes, as for me it was more about my emotional mindset. *How has MS challenged your perspective on life? What is the biggest sacrifice to the MonSter? MS completely turned my life around – I lost my job, my partner, my future. So I had to rebuild my life in its entirety. MS challenged me to ask my self ‘what really matters to me, now the worst has happened?’. MS gave me the opportunity to take up a long-held dream, writing, and this has led to so many opportunities. MS has made me appreciate life so much more, although the journey to this wasn’t at all easy. As for my biggest sacrifice, it has to be the ability to do things on the spur of the moment! I miss it. 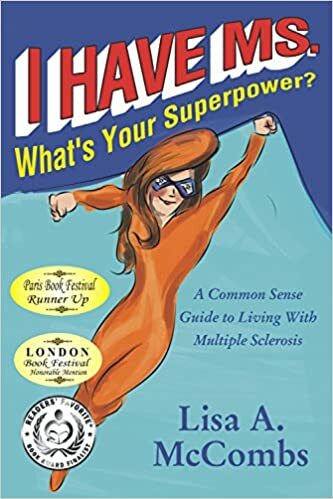 *Recommend an inspirational book (other than your own:) about living with MS.
* Speaking of your book, are you as an author represented by an agent or self-published? How does writing (your blog and your book) serve as therapy? I published through a very small publisher (a friend of mine, who had helped me edit the book). I’ve always said that writing about MS has been the best therapy ever! My blog is seven years old in October and the support I’ve had throughout those years has been incredible. It doesn’t matter what little problem I have, readers are quick to give advice, share their own stories and generally support me through some pretty tough times. I hate that MS Warriors are so plentiful in the world, but it is nice to connect with others who understand and relate to this life-changing situation. In all the negativity associated with multiple sclerosis, I am so happy to be able to connect with other Warriors who share my fears, my disappointments, and lost dreams. It is also nice to know that the MonSter is not defeating us. For every closed window, another always opens. Please consider sharing your story with us here on Lady with the Cane.